The 2018 Summary of Major Revisions highlights the revisions, the item numbers affected, and a list of all of the Special Provisions that have been incorporated from the 2011 Standard Specifications for Construction Book. It in no way reflects all changes that were made and users should be sure to read the book to find any differences between the two books. The Vermont Agency of Transportation takes no responsibility for any errors or omissions in this list of revisions. 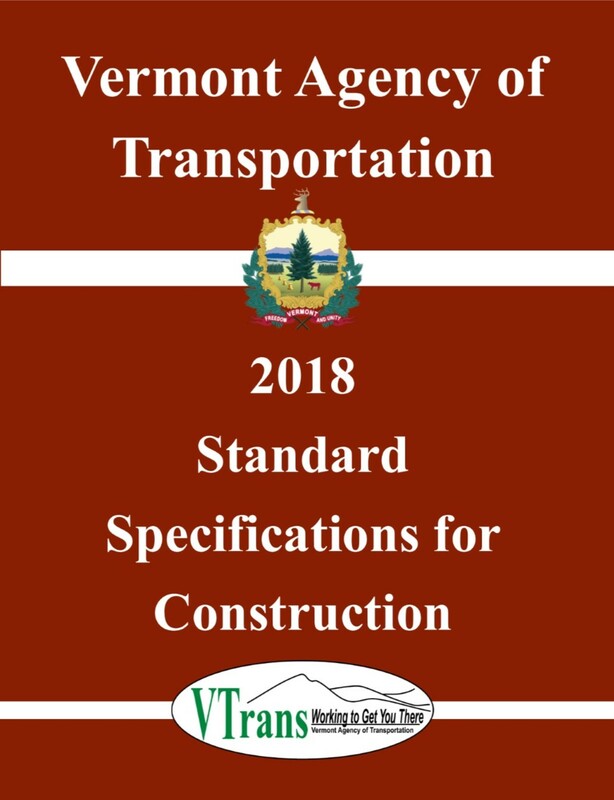 This copy of the 2018 Standard Specifications for Construction is an unofficial copy. It is provided for informational purposes only. The “Unofficial” 2018 Standard Specifications for Construction (hereinafter referred to as the Unofficial Specifications Book) incorporates, to the best of the Agency’s ability, all modifications made to the Standard Specifications by General Special Provision. The Agency has also fixed any small errors or errata, such as incorrect spellings or missing punctuation, that have been found. However, this unofficial copy as a whole has not been vetted or formally approved by the Specifications Committee. As a result, the Unofficial Specifications Book is neither legally nor contractually binding. It is provided here for informational purposes only, and no guaranty of any sort is provided regarding the contents herein. All efforts have been made to accurately incorporate the necessary changes, however, the Vermont Agency of Transportation takes no responsibility for any errors or omissions in this copy.